Audio5 - Music Player allows you to incorporate raw audio features into your website without using third party software as Quicktime or Flash player. The audio player verifies if the web browser supports HTML5 or Flash and reproduces the audio file in the required standard. Audio5 uses the new HTML5 <audio> tag. Great portability to the different web browsers. It can be used in the new browsers, that supports HTML5 standard and previous browsers with Flash player installed. Including the browsers in mobiles. Visual adaptability. The visual interface of the music player can easily be modified through the Audio5.css file. Intuitive configuration and use. Audio5 is distributed as a Adobe Dreamweaver extension, its installation and use is completely guided through the setup wizard. Audio5 has very practical controls to manage the audio playback. Among the playback controls available are: play/pause button, a progress bar, mute button, and a volume control. The seek bar and button for jump to different sections of song. The HTML5 standard today is imposing rapidly in the most used web browsers. Among the new labels that have been included in the new standard we put the emphasis on the <AUDIO> label. The <AUDIO> label allows you to incorporate raw audio features into your website without using third party software as Quicktime or Flash player. Unfortunately not all the web browsers support HTML5 yet. To name an example Internet Explorer will be able to support HTML5 from version 9 on, which brings us to the conclusion that a mixed audio setup in between HTML5 and Flash will need to be set in place to accommodate our user's web browser of preference. Our music player, Audio5, fulfills both tendencies. The audio player verifies if the web browser supports HTML5 standard or Flash, and play the audio file in the required standard. The Demo folder that includes a functional music player to be inserted directly in the website. The Dreamweaver extension folder, to install the audio player from Dreamweaver application (It is the easiest way to install Audio5. Recommended mode). 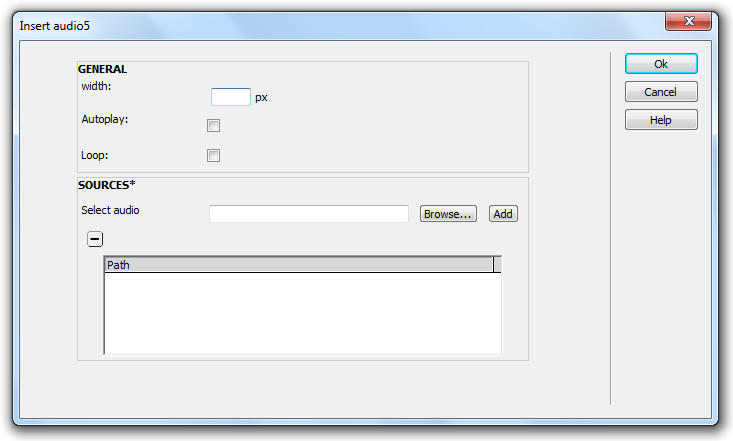 Unzip the distribution package and upload the content of directory "demo" to your website. In our tutorial the content of "demo" directory was uploaded to the website root, if you are using another location, the paths of files must be corrected. Copy the snippet of code below and paste it into the <head> section of web page. Copy the snippet of code below and paste it into the of web page. In the music player is possible to define multiple versions of the song to be sure that Audio5 is supported by all browsers. 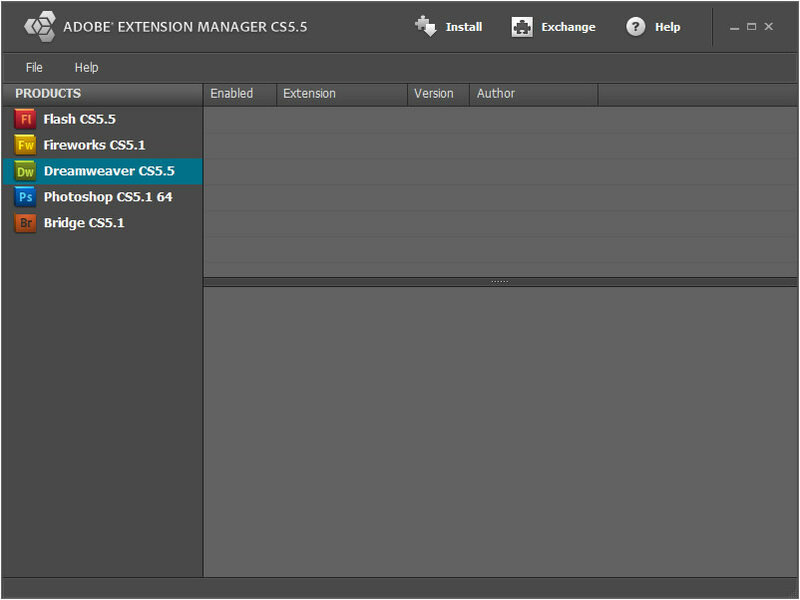 The extension has been developed to be installed in Adobe Dreamweaver MX 2004 and superior versions. To install the Music Player as a Dreamweaver extension follows the steps below. 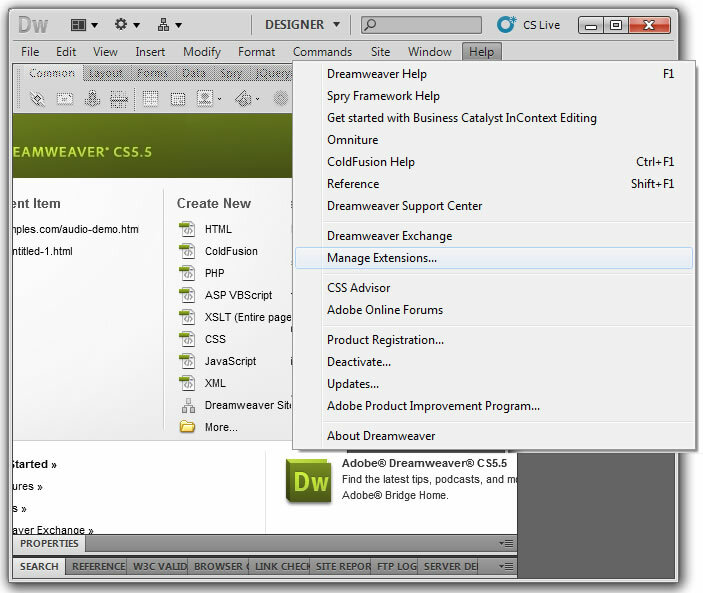 The Music Player can be inserted in the website through the insert bar "Common/Insert audio5" in the Adobe Dreamweaver Application. Follow the video tutorial, it contains a step by step description of the insertion process. Audio5 may be inserted manually in the website or using a the Adobe Dreamweaver extension. The last way is the recommended because the process is very straightforward and intuitive. Unzip the distribution package and upload the "demo" directory to your website. In our tutorial the directory content was uploaded to the root of website, if you are using another location, the paths of files must be corrected. Audio5 as Dreamweaver extension allows to share easily the audio files through the web and hardly any web development skills. First, open the page where the Audio5 will be inserted, in Adobe Dreamweaver. Notice: the webpage must be previously saved and the website correctly defined. Then press the option menu: "Insert/Insert Audio5" or through the "Insertion Bar" in the "Common" category(figure 1), to display the insertion setup. width: defines the music player width in pixels. autoplay: starts the audio playback after download the webpage. Pay attention, in some Apple gadgets (iPhone, iPad, iPod, etc.) the autoplay behavior is disabled. loop: the audio file will be played in a infinite loop. Pay attention, in some badgets the loop is disabled. sources: the Audio5 player don't accept a classic playlist, it allows to enter the location of multiple files' formats of same song. That's because the browsers have support for different files' formats. After complete the Audio5 setup, press the OK button. The insertion process generates a new folder titled "audio5" in the website's structure. The files extensions supported by Audio5 depends on the web browser where it is playing. Below a chart with the audio formats supported by each web browser. HTML5 standards are taking more and more space among the new generation of web browsers, still we are in transition stage where many web browser do not support new standards as HTML5 and that is what makes Audio5 a great tool for those who wish to share their audio files with a world wide user community. Not all the current web browsers support the HTML5 Standard. Below we offer you a list of web browsers that support the HTML5 audio tag. The rest of browsers use the Flash based music player. This questions are related with the Audio5, if you want to read the questions about another product, go to the product's page or the FAQ section in the main menu at top of the web page. Why the loop feature is not working in my iPad? Why the Autoplay is not working in the iPhone? I want to modify the music player appearance. How can I to replace the images in the css file? The loop feature was disabled by Apple from all gadgets that use the IOS operating system. If you load the audio5.css file in a text editor is easy to note that images were embed in the style's file using the mime format. by the URL of image to use as background. The number of users that consume information through mobiles devices today has increased considerably. The idea of combined products, capable of interact with the traditional browsers and the actual mobile browsers, has imposed over the previous products (only supported by desktop browsers). There are some manners to obtain similar results. For example, detect the browser where the webpage has been loaded, and insert an <audio> tag if the HTML5 standard is supported by the browser. This solution has various inconvenient; every browser has a particular interface for the <audio> tag that maybe are not compatible with your website design. Another inconvenient is the requirement of a flash based music player to use in browsers that has not HTML5 support. With both principles in mind: A music player capable to be used in all browsers and sharing the same interface, I have found Audio5, a very simple music player with basic controls; but a powerful product, tested in diverse situations. The Audio5 music player can be modified through a style file allowing me to adapt this product to a lot of projects. Resuming, Audio5 is a music player that I recommend to my colleagues and friends. I have checked this music player in ab iPad, with iOS as operative system with excellent results. Some features are disabled in my Tablet: The autoplay and loop are two of them, reading in the Apple website, I have found that these features have been removed by the manufacturer. The Audio5 is a perfect hybrid music player, it has the same behavior in the IE8 and the Chrome browsera, I have checked too in my Mac with similar results. In IE the music player uses the Flash player but in the rest of browsers use the native controls. The Audio5 music player is very thin and with serious colors, wonderful for all type of websites' designs especially to use in background sounds, because the music player is not the most relevant attention point it is no compete with main sections of the website. With little of knowledge, about cascading style sheet, is possible to modify the designs of music player to adjust it to the website. Pay attention, Audio5 embeds the images as mime in the CSS file to reduce the number of connections to the server resources.